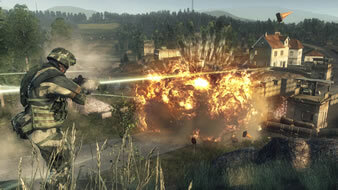 Having fun with Battlefield: Bad Company?? Maybe you need some tips.. Check out the Primo Battlefield: BC Guide previews which are now available in our downloads area. Been assigned to B Company? Just another one of the misfits and crackpots that the Army has to deal with? Well, you'll have a better time with your wartime experience in Battlefield: Bad Company™ if you check out the Prima Guide for this popular game. These two samples from the Prima Guide will get you indoctrinated for the adventure. Note: You will need Adobe Acrobat Reader to view these files. If you do not already have it, you may download it for free at the Adobe Web site.